Arizona’s 2nd congressional district is a competitive district, which for the past two years has been without representation as Rep. Martha McSally focused on running for the U.S. Senate (good riddance to her). Arizona’s 2nd Congressional District is being closely watched nationally because it is key to the Democratic hope of taking over the U.S. House. This is one of 25 House seats currently held by Republicans that were won by Hillary Clinton in 2016. That Republican is Rep. Martha McSally, who is running for Senate, so this is an open seat. The two women running to replace McSally are Democrat Ann Kirkpatrick and Republican Lea Marquez Peterson. Both are smart, accomplished women. But they bring very different political philosophies and experience to the job of serving this district, which includes parts of Tucson and stretches south to the Mexican border and east to Arizona’s border with New Mexico. Who most closely mirrors the district? 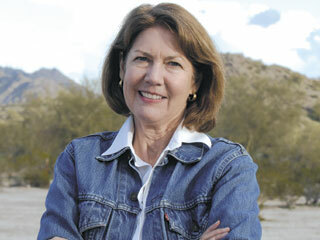 Kirkpatrick is well known in Arizona politics. She served three terms as representative from Arizona’s sprawling CD1, lost a lopsided Senate run to the iconic Sen. John McCain in 2016, and is now seeking to return to Congress from this border district. As a native of McNary – a tiny town in the east-central part of the state – Kirkpatrick has been accused of opportunism for moving to CD2 to run. Kirkpatrick says she has deep ties to the district. She attended the University of Arizona as an undergrad and a law student, and worked for the Pima County Attorney’s Office before moving farther north in Arizona. Marquez Peterson positions herself as the real deal in CD2 because she has lived in the district for 40 years. As head of the Tucson Hispanic Chamber of Commerce since 2009, she has built connections in Douglas, Sierra Vista and Nogales, as well as links with other border communities. She has a hands-on understanding of trade and commerce with Mexico. Marquez Peterson is a political novice [not really, she has been a cochair of numerous GOP campaigns], but she is not without political connections. She served on Gov. Doug Ducey’s transition team in 2014 and was invited to the White House, where she says she expressed concerns to Donald Trump about trade agreements and tariffs. Where do the candidates differ? TRUMP: Marquez says she supports “the majority” of Trump’s agenda but has concerns about his tone. Despite casting herself as the “hometown” candidate, Marquez Peterson’s call to separate Trump the man from his politics did not impress her hometown paper. Kirkpatrick opposes what she calls Trump’s agenda, which she says includes privatizing Social Security and Medicare, and turning back the clock on a women’s reproductive rights. IMMIGRATION: Both want immigration reform. For Marquez Peterson, this includes Trump’s border wall “where it makes sense,” as well as immigration reform that is “merit based” and includes a guest worker program to deal with labor needs. She supports legal status for “dreamers” but says citizenship should be handled in a larger reform effort. Kirkpatrick supported the Dream Act when she was in Congress, and she continues to support citizenship for dreamers. She opposes additional barriers, such as Trump’s wall, saying we need comprehensive immigration reform. HEALTH CARE: Another contrast is in their views on health care. Marquez Peterson wants to “replace” the Affordable Care Act, which she said has had dire consequences for small business. She has no plan, but says we “need to find something” that will maintain coverage for pre-existing conditions. Kirkpatrick is proud of voting for Obamacare when she was in Congress. She supports expanding eligibility so people can buy into Medicare, and she wants Congress to give Medicare the ability to negotiate prescription prices. Kirkpatrick says we should have done something to combat global warming 20 years ago. She calls for lowering fossil fuels emissions and says Arizona should be a leader in solar energy. Marquez Peterson has an impressive record as a business and community leader. As a politician, she is an unknown quantity. She self-identifies as a “lifelong conservative Republican,” but this district is nearly evenly split among Democrats, Republicans and independents. Prior to McSally, CD2 was known for centrist representation, including Democrats Gabby Giffords and Ron Barber and Republican Jim Kolbe, when the district had a slightly different configuration. Marquez Peterson promises to be an “independent voice,” but she also says she supports the majority of Trump’s agenda. Kirkpatrick stumbled when she took on John McCain. Who wouldn’t? But when she was in the House she demonstrated a toughness and a willingness to work across the aisle – even on issues that were not entirely popular with Democrats. In 2013, Kirkpatrick worked with Republicans Reps. Paul Gosar, David Schweikert and Matt Salmon on an effort to block the Tohono O’odham Nation’s plans to build a casino on land it purchased in Glendale. The casino faced strong opposition, but the Tohono O’Odham eventually won [in court]. These are not exactly selling points for Kirkpatrick to Democrats, it is the kind of thing important to a Republican newspaper which supported these positions. But Marquez Peterson would have done the same. The significance of this district as a puzzle piece in partisan efforts to control Congress is less important to the people who live there than the quality of the representation they get. Kirkpatrick has shown she can deliver. Her proven record of reaching across the aisle in Arizona’s best interests and her centrist tendencies make her the best choice for CD2.